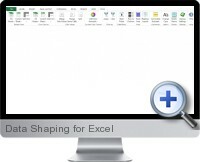 The Excel Data Shaping add-in (Dose for Excel) implements a new menu ribbon item with a suite of tools for fast manipulating and formatting of data for reporting and analysis. More than 50 commonly required data shaping routines are made simple with one click options to perform tasks on selected ranges in Excel. The data management routines are designed to save time and ensure accurate shaping of data for error free analysis. Deleting matching criteria in all cells including entire blanks rows, rows with at least on blank cell, rows with custom values or identical rows. Removing spaces leading or trailing cell content, all spaces or more than more space between words. Merging cells by rows or columns or cells with identical content. Splitting cells based on values and content. Saving and applying advanced styles with font and color options. Filtering data by selected value. Date choosing from pop out calendar. Changing data layout sand views such as rows to columns, work areas and reading view switching. Dedicated many for creating cell comments with options. One click case changing options for text content. Sheet naming and backup functionalities. Works with both 32-bit and 64-bit Excel and tools added or upgraded in future versions are free.